A detailed fun travel guide to the best Rajasthan palace hotels, camel safaris, havelis, luxury trains, and the Pushkar fair, by Vijay Verghese with photography, and more from SmartTravelAsia.com and Dancing Wolf Media. Splendid desert retreats from regal to rustic, ill-mannered camels, snake charmers, and the world’s longest moustaches. IF YOU must get sand in your shoes and a searing tan that sticks, the only thing better than the beach or a weekend in the microwave, is a dash to the desert. This is more for broiled Europeans than Indians who, with the accumulated wisdom of 5,000 years, limit their beach derring-do for the monsoon rains or when the winter chill takes some of the bite off the bake. The epicentre of all that alluring dust and din in Rajasthan, India, is a tiny speck of a village called Pushkar. Late November, come full moon when the air is cooler, immense herds of Japanese tourists, Italians, bug-eyed New Agers, camels and horses are headed here for the Pushkar Camel Fair, a fortnight of splendid revelry with camel races, animal auctions, folk music, and contests for the world’s longest moustaches, the proud metres-long specimens borne aloft by tugging well-wishers. The village, arrayed around a lake, hosts over a thousand temples to various deities – including one solitary homage to Brahma, the Creator – wall-to-wall Rajasthani bric-a-brac, musicians, snake charmers, black-faced langur monkeys, and God Men slathered with ash, their tongues reverentially skewered. It is a carnival like no other with a press of people that surges like a current from one event to another along all too narrow streets. Perhaps with some help from Brahma, there’s even some pretty good pizza for nervous travellers reluctant to dip their toes into tandoori. Pushkar, a 15-minute drive from Ajmer and two hours from Jaipur, is metaphorically on the lip of the dunes that start farther on beyond Jaisalmer and proceed west as the rippling Great Indian Thar Desert. The Thar Desert occupies northwestern Rajasthan that extends limitlessly into great heaps of wind-tossed sand dunes that constantly threaten to overpower even tree-lined New Delhi. Southeastern Rajasthan embraces the rugged brushwood of the Aravalli Hills. It is a wild and untamed state where Rajputs – moustachioed, tanned, rugged and handsome – take the business of hospitality quite seriously. After all, they spent hundreds of years battling invaders from Afghanistan and Persia and are nowadays keener to welcome the invading hordes and relieve them of their dollar burden. Everything here is bigger, better, older, and bolder. Whether you are dwarfed by the towering folds of a brightly-hued turban, the soaring ramparts of Chittorgarh Fort, or an elephant lumbering up the ramp to the magnificent Amer Palace outside Jaipur, this is jaw-dropping country. Rajasthan will also delight with its delicate marble carvings as at the temples of Ranakpur and delicate frescoes and filigree sandstone walls adorning noblemen’s havelis (or mansions). Imposing royal residences, many converted into the finest Indian palace hotels, compete with bright guesthouses that are kinder on anorexic wallets. Get oriented first and start with a Rajasthan Map. Boasting a history that goes back well over a thousand years – indeed to the birth of the sun and moon, as various princely dynasties aver – looking out onto the endless desert, it is easy to imagine marauding hordes going about their business of pillage and plunder. The untold treasure of Rajasthan’s stately cities, towering forts, and grand palaces was the stuff of legend. Street food is only for those with cast-iron stomachs. Drink just boiled water, piping hot tea, or bottled mineral water. And stay away from ice, and freshly washed vegetables. Jaipur, also known as the Pink City, was thus christened when in 1876, the Maharaja Man Singh the second painted the city pink to give the Prince of Wales a royal welcome. About 258km from New Delhi, give or take with diversions for meandering herds of cows or randomly parked lorries, Jaipur, the capital city of Rajasthan, is accessible by a major highway from Delhi that can be traversed in under five hours (or four hours very optimistically). Buses, both deluxe and regular, shuttle to and fro almost every hour between the two cities, and private taxis can be hired as well. Or you could do the painless 35-minute flight from Delhi on a number of airlines. Then there are the trains. If you like the clickety-clack of rail travel and the hustle of Indian stations where you’ll experience more in ten minutes than in a lifetime, try the Palace on Wheels (www.palacesonwheels.com) which takes you effortlessly back in time. The journey (upwards of US$390 per night) begins at Safdarjung station in New Delhi (more civilised than the maddening scrum of Old or New Delhi stations) and takes in a weeklong traipse through the sights, palaces and forts of Rajasthan. This luxury Rajasthan train tour is in air-conditioned and comfy saloons. Expect two lavish restaurants, a bar, wall-to-wall carpeting, spa, fitness centre, and the obligatory royal gilt furniture. Heritage on Wheels (www.indianrailways.gov.in) is a luxury tourist train that takes you by narrow meter gauge to less explored regions of Bikaner and Shekhawati – both embodying the artistic heritage of Rajasthan. Check in at Jaipur station and off you go. Newer offerings include the Royal Rajasthan on Wheels (www.royalrajasthanonwheels.com) from the Rajasthan Tourism Development Corporation, upwards of US$590 per night, also departing from Delhi’s Safdarjung Station, and the Maharajas’ Express (www.maharajas-express-india.com) that inscribes a longer circuit from Mumbai to Delhi including Ajanta, Udaipur, Jodhpur, Bikaner, Jaipur, Ranthambore and Agra. Travelling like a maharajah means perks like WiFi, plasma TVs and DVD. Planes, trains, automobiles, and camels. Rajasthan palace hotels, here you come. But first, check out the environs closer to Delhi as you drive through increasingly arid scrub heading for the desert heartlands and its sentinel forts and gilded palaces. On with our Rajasthan palace hotels review. Closest to Delhi as you set off for Jaipur is the Neemrana Fort-Palace, situated just 100km from Delhi's international airport. Built in AD1464, the Neemrana Fort-Palace ranks high among the pantheon of the top Indian palace hotels. It is not overly luxurious, but it is a majestic and carefully restored confection. Neemrana became the third capital of the descendants of Prithviraj Chauhan III, who was killed in battle by Mohammad Ghori in AD1192. All that gore aside, this is a striking 25-acre property. The palace is cut in semi-circular terraces running down the hillside watching over the pastoral scenes and the town below. It rises up 10 levels ensuring fabulous views in all directions (even the bathrooms are designed to have a view, so you can feel like royalty on your “throne”). Pin-stripers will be glad to note that it is entirely possible to hold a smart company meeting for 30 to 150 people at this address. And what better way to build your team than to hitch them on a zip line and send them on an aerial tour above the fort? It’s the best way to pick the luminaries from the laggards. 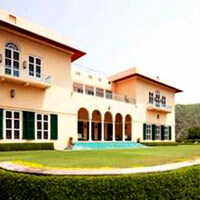 Sariska Palace lies on the Delhi-Jaipur highway, approximately 220km from New Delhi. In classical white with an outlying garden, Sariska Palace was built as a hunting lodge at the close of the 19th century by Maharaja Sawai Jai Singh of Alwar. 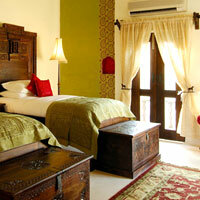 Sited in a tranquil, wooded valley, it is on the threshold of the Sariska National Park. With somewhat spotty service and not terribly grand, this is not a place for fussy travellers. But if the countryside and views do it for you, it will work. 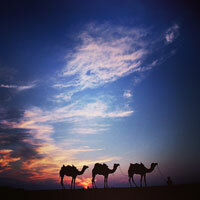 Try camel and horse safaris, jeep rides, wildlife spotting, and nature walks. En route to Jaipur, about 40 minutes (and 42km) from the city, tucked into an offshoot of the stern and stark Aravalli Hills, is the picturesque 400-year-old Samode Palace that will have you – and your camera – salivating. Bring along sufficient megapixels for this treat. Drive through a series of imposing gates set in the outer and inner walls, past the restored village with its colourful local arts and crafts up to the main driveway where steps lead up to your marigold garland and red tikka welcome. By the late 1800s Samode was one of the wealthier areas in the Amber (Jaipur) region. In the early 19th century under Rawal Berisal, the mansion, with its imposing ramparts and domed chhatri pavilions, started taking its current shape in the shadow of the fort atop the hill. Wander into the breathtaking, hand-painted Durbar Hall and its magnificent earth-red frescoes in intricate patterns. Nowadays it can host a small corporate meeting in style. In days gone by, royal ladies peeked down into this hall from the blue wood-shutter windows of the jarokha adjoining the Sheesh Mahal (hall of mirrors). These two storied additions to the palace are credited to Berisal’s descendent Rawal Sheo Singh, who was prime minister of Jaipur for several years during the mid 19th century. The 42 rooms are set around a succession of sun-drenched yellow plaster courtyards with the terraced suites on the higher floors. Living space is HUGE, especially in the suites, which offer private courtyards with Jacuzzis serving up amazing views. Expect a well-lit living area with bright sofas and a large flat-screen TV (with BBC and a few international channels), period furniture, a four-poster bed set in gauze drapes, a spacious marble bathroom with twin vanities, Indian toiletries and hairdryer, bathtub and rain shower, archways bordering additional little alcoves for work or a sit-down with a good book, Lavazza coffee machine, and regal family portraits of Jaipur royals including the doe-eyed late Maharani Gayatri Devi. There’s ample luggage space for the Louis Vuitton crowd, an electronic safe, and several three-pin round-hole electric sockets. The best thing about this journey back in time is the absence of intrusive WiFi. Simple brass switches turn lights on and off. No hi-tech gobbledegook. WiFi is available, however, in the reception courtyard. Sit down with a hot masala chai (tea) and get connected if you must. Later, step out for a meal at a fine dining restaurant where succulent kebabs await, plunge into an outdoor marble inlay pool or grab the rays at the rooftop infinity pool set in a timber patio. Without pretension or guile, this offering is easily one of the best Rajasthan palace hotels in the business and service is attentive to a fault. Just three kilometres away and spread over 20 acres of beautiful gardens with roses, bougainvillea and scented flowers, is Samode Bagh, the second in the Samode quartet. It offers luxury canvas and brick tents, with air-conditioning, a work desk, shower, tea maker, and a small verandah. Here you might enquire about horse rides cross country through the scrub or around neighbouring villages. There’s a pony too for kids. This is a good spot for banquets, weddings and robust get-togethers in rustic surrounds with plenty of elbow space. Newcomer the Fairmont Jaipur (opened 2012) is a luxury Jaipur palace hotel with strong accents of Mughal architecture with Rajasthani flourishes. The 255 rooms start at 50sq m with foyers, vaulted ceilings, plump beds, soaking tubs, large flat-screen plasma TVs, rich interiors with touchy-feely fabrics, and WiFi. In true palatial style, the Fairmont also serves up one of the largest convention halls with 5,500sq m of space for meetings of all description and five function rooms. With an abundance of pink sandstone, breezy domed pavilions, water features and gardens, this address is a regal retreat as well as a premier Indian conference hotels pick. Trendsetter The Oberoi Rajvilas is about eight kilometres from the city centre, and parked over 32 acres of landscaped gardens. It feels almost sacrilegious to call Rajvilas a hotel. This Rajasthan luxury resort was built with the singular intention of reviving the old-world grandeur and princely heritage of this Indian state. Rajvilas is the sort of resort you would gladly hand over all the money you saved up for mum and dad’s 50th anniversary. If this makes you feel a tad soulless and shallow, shove some more caviar down your gullet. Feel better? Scattered liberally with pools, fountains, lotus ponds, crenellated walls and turbaned attendants kowtowing to your every whim, Rajvilas has hosted celebrities like Naomi Campbell, Bianca Jagger, the Duke and Duchess of Kent, and Bill Clinton. The Premier rooms are set around serene courtyards in the traditional style. There are authentic teakwood four-poster beds and, for when your libido and romance runs out, private, walled ornamental gardens, for a quiet reflective stroll. Soak in your own sunken tub and watch DVDs while sipping a vodka-tonic. If you want more, they’ll give you more in the shape of luxury tents. Don’t think sagging tents with sleeping bags from school trips of yore, steaming with the Great Unwashed. Think embroidered canopies, air-conditioning, Burma teakwood floors and Edwardian claw-foot bathtubs. Top of the line comes in the form of two Luxury Villas and the Kohinoor Villa, each with private pools and eye-popping memorabilia. If you prefer hoary history, mosey along to The Rambagh Palace. Built in 1835 by the queen for her favourite handmaiden, it was in 1925 that this relatively modest casa was converted into a palace for the Maharaja of Jaipur. It had by then, in the due course of the century, served time as a royal guesthouse and hunting lodge. Post 1920, it once again became the home of the royal family. Maharaja Sawai Man Singh II converted it into a hotel in 1957, and the highly regarded Taj group of hotels took over the reins in 1975. That’s a lot of heritage crammed into one hotel. History bristles in every nook and cranny, from the marbled corridors to the sprawling 47-acre gardens where peacocks wander strutting long turquoise tails as horsemen in regal livery canter past, pennants fluttering on their tall lances. At times a horse-drawn carriage may be available for photo ops and the kids. This is the sort of place to enjoy a cuppa in the gardens or even a quick chukker of polo. If horses are not your style you may get lucky atop an elephant (though their polo playing is a lot less agile). 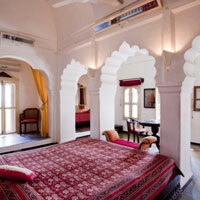 A total of 79 rooms and suites are on hand at this top Rajasthan palace hotel. Apart from a few luxury rooms and around 40 palace rooms, there are different suites; 24 historical suites, for example, which welcome the dusty traveller with an arsenal of amenities including a personal butler on call all day. Walk-in wardrobes (available in all suites) should prevent any packing disputes with your Better Half. 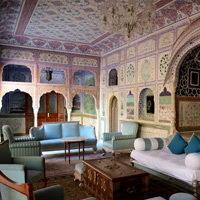 Most of the Royal Suites used to be the personal rooms of the Maharaja of Jaipur himself. Yes, he needed a fair bit of stretch room. There are also two Grand Royal Suites, including the 1,600sq ft Maharani Suite, which was created for Rajmata Gayatri Devi as a surprise gift. Expect a large LCD flat-screen TV, DVD, and WiFi (that is charged). Later, drop by the Polo Bar where the décor will whisk you back to the days when the Jaipur Polo teams gave the English a run for their money. 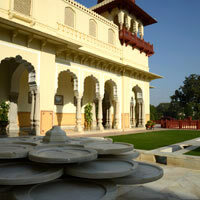 Also part of the Taj Hotels’ repertoire of Rajasthan palace hotels is the Jai Mahal Palace. Not in the same league as Rambagh but substantially flavourful, this palace dates back to AD1745 and is set in 18 acres of manicured Mughal garden over three levels (complete with extensive waterways). It is located close to the main bazaar and is a good staging point for a Jaipur shopping expedition. The interiors focus on heritage bling and drip with obligatory crystal and period pieces. There is a spa too. All of the 104 rooms including six suites, have colonial-style furniture, miniature paintings, gold-hued silks, and stylish bathrooms, offering contemporary comfort. Expect a tea/coffee maker, mini-bar, safe, TV, and hair dryer. Wi-Fi is available. Chomu Palace Hotel is a 300-year-old heritage property in Chomu town, Jaipur. The elegant courtyard is a melange of European and Indian decadence, thankfully separated into rooms with differing styles. The 58 large rooms and suites all sport large TVs, separate bathtub, tea and coffee facilities and safe – but it’s not the standard amenities that impress. The décor is the centrepiece of each room and restaurant. Romantic silk boudoir or aristocratic Parisian chic suites are filled with antique furniture, marble bathrooms and details such as the heritage bedside telephone. Restoration of this Rajasthan palace resort has been intricate and thoughtful, creating a romantic retreat for a heritage holiday. On the Delhi-Jaipur highway, the Le Meridien Jaipur is a spacious 25-acre property with faux traditional touches. This is a useful address for business and pleasure, and WiFi is available in all rooms. The Le Meridien is a child friendly hotel with its Penguins Club offering a daily roster of fun activities to keep tots entertained. For movie buffs there’s nothing less than a 42-seat cinema – on the premises – and a spa will ease away those hard-day aches. Located on the outskirts of the Pink City, on the Delhi highway, The Le Meridien is just a 25-minute drive from the city centre, so guests can enjoy the best of all worlds. It’s literally a five-minute drive from the historic Amer Fort. The ITC Rajputana, Jaipur, is a 15km drive from Jaipur airport. The neat red brick hotel is not entirely in the same league as its illustrious peers but it is a functional hotel with good service. This former Sheraton (now upgraded to Starwood's Luxury Collection with some nips and tucks) is a good pit stop for the young and restless with excellent restaurants including the 24-hour Chandravanshi Pavilion that serves scrumptious “dum pukht” (steamed Indian casserole) dishes. The Trident Jaipur from the Oberoi group offers unobstructed views of the rugged Aravallis and is en route to Amer Fort. Most of the 134 rooms overlook picturesque Mansagar Lake or the hills. Expect WiFi and bright and airy rooms. Pets aren’t allowed, but children certainly are, with babysitting services provided, and a Child Care Centre too. This is a neat modern construct in the Rajasthani mould. The much frescoed and brightly caparisoned Raj Palace is conveniently located smack in the middle of the four historic sightseeing areas of Amber Fort, Jaigarh Fort, Nahar Garh Fort and the City Palace, as well as being close to the vortex of all that frantic Jaipur shopping. A small luxury boutique hotel, it offers only suites, and is home to an antique crockery museum, which has collections that are over two centuries old. Just don’t break anything. The hotel keeps pictures of all the celebrities who’ve dropped in – Bollywood superstar Amitabh Bacchan, novelist Frederick Forsythe and Lord Mountbatten gaze benignly down on visitors. It was in 1995, that the Princess Jayendra Kumari Ji decided to restore this luxurious palace (built in 1727) to compete with the best Rajasthan palace hotels and boutique resorts. The residential quarters, courtyards, and arched corridors were all revamped. The finest of the royal antiques are kept in the wholly original Museum Suites, while antique furniture, delicate hand-painted frescoes and mirror work adorn the entire place. 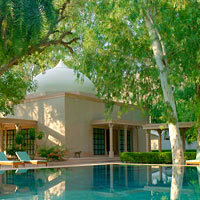 Another option in the Jaipur area, just 35km out, is The Gateway Hotel Ramgarh Lodge, managed by Taj. Set in green surrounds by breezy Ramgarh Lake, this former hunting lodge of the Maharaja of Jaipur dates back to 1920, vintage enough for many and with contemporary pampering. Think 8,000 acres of farmland, cycling, camel rides, cattle fairs and cooking demonstrations and a visitors' roster that includes Prince Charles and acqueline Kennedy. The Mandawa group has two properties including Castle Mandawa in Shekhawati, and the Mandawa Haveli in Jaipur, a pleasing structure in the heart of town with the customary archways, pillared walkways and courtyards. 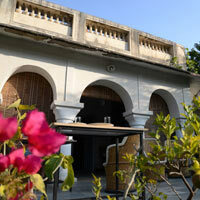 It consists of 70 rooms with sunlit verandahs and lawns for evening walks. The verandahs offer views of Nahargarh Fort. For something atmospheric, homey, and friendly explore family home, DeraMandawa (just three kilometres from the City Palace) run by Thakur Durga Singhji, a veteran travel professional with a keen eye for detail and history. Ask him about his horses. DeraMandawa is not connected to the other Mandawa group. 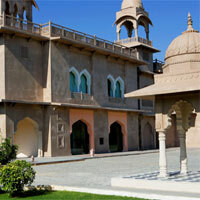 This Rajasthan palace hotels experience brings you up-close with the owning family. Someone with true-blue lineage will assist and guide you personally through your stay. The family still lives in residence at this historic mansion, or haveli, and this perhaps accounts for the intimate feel of the place, more home than hotel. Opt for a spacious suite and sleep under plaster arches and latticework railings on a bed large enough for a regiment – all this with a vast array of breakfast options. Dine in, sun yourself in the courtyards, or enjoy the pink city’s many distractions. Check out the chic cubist Lebua Lodge at Amer, that serves up a luxury tent escape in a green setting with modern marble bathrooms and enough running water to slough off the desert dust. It makes for a nice pit stop in these parts with a high level of personal pampering. Expect green open views but not too much privacy. Lohagarh Fort Resort Jaipur presents a somewhat campy front as you drive up to the mock stone battlements and gate. Yet this 13-acre resort set in green brushwood on the low Kukas Hills near Jaipur offers some interesting accommodation including virginal white Luxury Suites with stonework walls, a Tree House, a Tent and Cottages with pools. Step into neat bedrooms with stone walls, marble bed plinths, marble floors or timber floors with wooden walls and rustic wooden plinths to raise the bed to regal heights. The design is playful, thoughtful and uncluttered with an occasional leopard skin on the floor. A rough-hewn slab of marble under the bed instantly adds a dash of the outdoors while melding easily with marble floors. Work desks are similarly rustic. Other cottages offer an Alpine feel with A-frame roofs and large picture windows. The free-form pool too offers much stone surrounds and a small waterfall. Bathrooms are modern and coffee-making facilities will get your mornings started breezily. Apres-room wander out for a spa or yoga session or head farther to the Elephant Village for a mammoth ride. The resort tends to run things on a full board basis with inclusive breakfast, lunch and dinner. This may not be a bad thing as it saves time to focus on the outdoors. This is a bit out of the box and will be fun for the whole family. It is situated a short distance out of Jaipur on the Delhi highway, after Amer. In Jaipur, the to-do list may include Hawa Mahal (the palace of wind) and the Jantar Mantar observatory. City Palace is an imposing structure. The towering sprawl of Amer Fort just outside Jaipur is credited to Raja Man Singh, with Sawai Jai Singh making some additions in later years. At various times, elephants lug tourists up to the citadel. There are jeeps and guides too. Within the palace compound are the Diwan-e-Aam (hall of public audience) and the Diwan-e-Khas (hall of private audience). If you are in the area for the Camel Fair in the holy town of Pushkar, about 145km from Jaipur, consider staying at The Greenhouse Resort. This eco-boutique property is an oasis in the heart of Rajasthan. 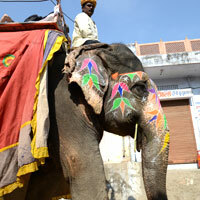 It is 10km from the hustle and bustle of the Pushkar Fair. 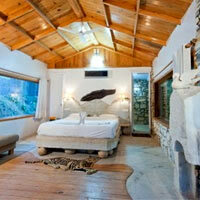 Comprising 20 well-appointed air-conditioned tents, the setting is unhurried with water features. The place exudes an air of understated opulence. The owners, Saurabh and Parul Sharda are hands-on managers and take special pride in their eco-friendly initiatives. In fact there is a greenhouse with Dutch roses and gerbera flowers for the floriculture enthusiast – all in the midst of some exceedingly inhospitable dry terrain. While Ajmer has its share of hotels, many of them hysterical faux palace ensembles – all within reach of the venerated dargah of Sufi saint Moinuddin Chishti – you might opt for something small, homey and memorable, like the Ajmer Bungalow run by Naveen and Rajika Capoor in a renovated family home (dating back to 1908) with just enough plaster crumble and grass underfoot to feel totally at home. Trawl through family memorabilia, old paintings and furniture (each piece yielding a historical footnote, like the dining room chairs dating back to the Delhi Durbar of 1911), planters’ chairs with extended legs for lazy tipplers, a functioning pedal organ, a record player and, in season, the garden with its flowerbeds concealing Bijli the dog and the fragrant raat ki raani that only releases its scent under stealth of night. There are three spacious bedrooms with modern bathrooms and a spare back bungalow. Expect serene pale blue-green hues on walls and doors, dressing areas with old cabinets, and electric geysers for the showers. Electric sockets are three-pin round hole with the customary 220volt AC current. The rooms are set along a wide verandah that runs around the front of the home looking onto the garden. A central living room serves as a comfy meeting place for chats, perhaps even over a roaring fire (there is a functioning fireplace for the crisp winters), while a small dining room is set just behind. Naveen is an excellent creative cook and his menus, dependent entirely on mood, seasonality of produce and guest whims, may run from delicate kebabs to bund ghosht (spiced mutton curry with potato) and jangli ghosht (spicy chilli-and-ghee slow-cooked mutton). This is not a hotel. It’s a functioning home that can connect you with silver sellers and taxis but best of all may be the lazy evening chats ranging from jovially pedestrian to the profound. 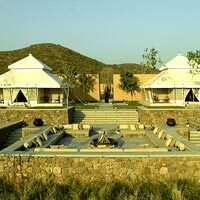 The tented Chhatra Sagar camp offers a few luxury tents 95km from Ajmer. It is sited above a picturesque reservoir dating back to 1890 when the first dam was built to harvest the monsoon rains. The area is open and ideal for reflection, long walks, and a good book. Pushkar is a delightful little village with the aforementioned 1,000 temples and more devotion than you could shake a trident at. It is a 15-30 minute drive depending on traffic and route. During the Pushkar Camel Fair in November, cars are usually made to park a couple of kilometres outside the town so be prepared for a brisk stroll and plenty of vegetarian food. Ranthambhore, in the southeastern corner of Rajasthan, is approximately 130km from Jaipur. Ranthambhore National Park is well worth a visit and not just for tiger spotting. The park lies at the edge of a low plateau, with the Banas River to the north and the Chambal River to the south. The brooding fort watches over the reserve, home to tigers, leopards, chital and sambar deer, crocodiles, and a variety of birds. Much coveted by the mighty Mughals, the fort was the scene of bloody battles, untold carnage and tales of lofty heroism until Emperor Akbar’s armies finally marched in, in the 16th century. Aman-i-Khás, run by Singapore-based Amanresorts, is an exclusive jungle encampment with luxury tents evoking the Mughal style of yore. A soaring canopy covers the 108sq m quarters with rooms partitioned by gauzy cotton drapes. Nothing terribly rugged or taxing here. Expect a king-size bed, writing desks, cupboards and twin vanities. The Spa Tent offers a range of rubdowns, pummelling, aromatic treatments and relaxing massage. It’s all just the tonic after a hard day’s tramp in the woods. At the Lounge and Library you’ll find a good stock of CDs, CD players and books. Expect an outdoor swimming pool too. The Aman-i-Khás experience centres on nature and trips into Ranthambore National Park to spot the big cats and other wildlife, usually in the early hours of the day before the sun climbs too high, or late in the afternoon. Camel safaris can also be arranged. Towards the edge of the tiger reserve, nestled in the wilderness, you’ll spot the taut tarpaulin tents of The Oberoi Vanyavilas. 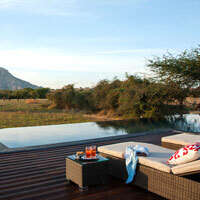 A spectacular watercourse is a special feature here as are its luxury tents with their private, manicured gardens. Oberoi knows a thing or two about pampering guests and you’ll feel it in the service and style of the place. This is a comfortable staging point for sweaty odysseys into the park. Cap off the evening with a visit to the Library Bar with its selection of spirits, cigars, wines and books. Or pop into the spa to rub off those jungle smells and paw prints. There’s an outdoor pool as well. To experience more of Amanresorts in Rajasthan head for the stately Amanbagh in Alwar nestled in the rugged undulating contours of the Aravalli Hills. Amanbagh (combining the words aman or “peaceful” in Sanskrit and bagh or “garden” in Hindi) is a splendid oasis in the midst of the stark and beautiful, yet relentlessly arid, landscape. This walled compound was once used by the Maharajah of Alwar for his hunting trips as the royal party followed in hot pursuit of game through the area. Latter day travellers still chase game, capturing their “sport” this time on camera. Amanbagh offers a lovely, tranquil setting, conjuring up a sense of a bygone era in its authentic recreation and restoration of the compound, its flowering shrubs and trees. 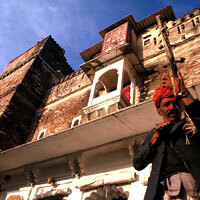 There are Courtyard Haveli Suites, Garden Haveli Suites and Terrace Haveli Suites. There is a main 33m swimming pool set within the gardens but 16 Pool Pavilions offer their own pampering private pools and gardens. Pick up a good book and immerse yourself in history at the Library or spoil yourself silly at the Spa where therapists are on hand with an arsenal of healing treatments and other aromatic distractions. From here, head out to visit Ajabgarh Fort, the Satimata Dham temples at the rim of the Sariska National Park, Mansarover Lake or the game reserve. Ramathra Fort between Bharatpur and Ranthambore is a heritage site with fort, lake and rustic countryside to explore. Stay in a suite with fireplace or camp out in a Luxury Tent. The best time to visit is during the spring-summer months March to July when the greenery is appearing and the lake is better fed. The City of Lakes, Udaipur, is approximately 347km from Jaipur. Its ornamental and aesthetic centrepiece is Lake Pichola on the banks of which sprawls The Oberoi Udaivilas. Udaivilas, and its ubiquitous sandstone elephants, takes luxury up a notch. One branch of the Rajputs are said to have descended from the Sun God, and the gold disc that represents him is a recurring motif at this Rajasthan luxury resort. Gawping out of the huge windows presents a spectacular view of the terraced gardens overlooking the lake, and the historic City Palace. The rooms offer premier digs and luxury suites, all decked out with regal silken canopies and marble bathrooms. The Luxury suites take you back to the indolent days of the Raj with private butlers, and private pool. If your wallet is up to it, the vast 2,650sq ft Kohinoor Suite offers a huge private pool, a courtyard with fountains, a private sauna, and a raft of spoiling amenities. Being located close to Lake Pichola is a huge bonus for any hotel, not least because of the imposing City Palace (built AD1567) right on its banks. There are four major palaces and several smaller princely homes and havelis, as well as engaging sights such as Mor Chowk (peacock courtyard), Khush Mahal (palace of happiness) and the Tripolia (the triple arched main gateway). The Trident Udaipur close to Udaivilas has 43 lush, landscaped acres, all a 10- minute drive from the city centre. Its Amrit Mahal bar offers traditional Mewar ambience, as well as the usual – and not so usual – tipples, while the Aravalli Terrace offers alfresco dining with huge views of the lake, the brooding Arvalli hills, and Sajjan Garh (Monsoon Palace). The Trident Udaipur is smart and well kitted out in all the usual Rajasthani trappings but at a more attractive price point. 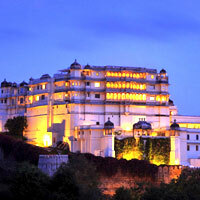 It is a useful launching point for an exploratory trip of Udaipur. For those in search of a Rajasthan heritage hotel with ambience and a simple, uncluttered style, the Shikarbadi Hotel is worth a look-see. Its cottages offer rustic chic – wake up to the calls of a peacock right outside your window. Shikarbadi used to be the hunting lodge of the Royal family of Mewar, and its long winding driveway takes you past its very own stud farm, and private hangar with quaint airplanes. The Lalit Laxmi Vilas Palace Udaipur (formerly The Grand Laxmi Vilas Palace) was originally built in 1911 by Maharana Bhupal Singh as a residence for Winn Gate, the British political agent at the time. In 1945 the palace was rebuilt as a royal guesthouse for visiting dignitaries and high-ranking British officers. The Lalit Laxmi Vilas Palace sits on 23 generous acres and is on the banks of the Fateh Sagar Lake with views of Sajjan Garh. Kitted out with the obligatory Maharaja and Maharani suites, the hotel also offers executive suites and palace deluxe suites. Try out royal buggy rides, and a sound and light show. In another first for Rajasthan palace hotels, this one boasts the largest outdoor swimming pool in Udaipur. Anyone familiar with Udaipur and the fabulous, if sometimes dry, Lake Pichola, will be religiously drawn towards a mirage over the shimmering waters – a floating citadel. The Taj Lake Palace Udaipur, where a young prince once enjoyed moonlit soirees with his lovelies, is now an internationally acclaimed heritage hostelry, impeccably pickled circa 1740s, a marble monument set atop the mirror-smooth Pichola Lake, looking out to the city and its ring of royal buildings along the shoreline. One of the best Rajasthan palace hotels, this is without any doubt, a true taste of history for connoisseurs of the Indian experience. The place is all glistening marble and glittering mosaics. Built in 1746 by Maharaja Jagat Singh II, the palace is spread out over the four-acre Jag Niwas Island. The Lily Pond Courtyard hosts memorable dinners, while the Royal Barge allows you to party in style. The rooms and suites are dripping with regal memorabilia. The Chandra Prakash Suite (roughly translated as “the lustre of the moon”) serves up more chandeliers, marble and gilt than you could shake a stick at. The rooms and suites are decked out in opulent silk drapes, colourful murals and period furniture. Every evening, the courtyard by the bar switches into royal mode with a traditional dance performance. There is also a historic walkabout tour (that comes with a glass of champagne) every evening. Best of all are the slow journeys by boat to simply “arrive” at this splendid confection. On the banks of Lake Pichola, on an evening after the monsoons clouds have unburdened their welcome harvest, The Leela Palace Udaipur shimmers above the waters, all domes and chhatris and regal Rajasthani symmetry. All the 72 rooms and eight suites have the privilege of looking out across the water when the lake is full. Alternatively, guests can enjoy the ESPA that runs a wellness operation under tents, book a boardroom, organise a corporate meeting, or simply savour some yoga, folk dances or cooking classes. There's no missing the striking profile of the 18th century RAAS Devi Garh (until early 2016 under the management of the Thailand-based Lebua group). 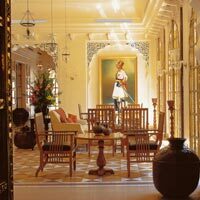 In Delwara Village, overlooking one of the three passes that lead into Udaipur, this Indian palace hotel has been carefully renovated, immaculately adorned in local marble and semi-precious stones. The spa serves up lux wellness treatments with products from L'Occitane. The 39 suites are regal yet utterly contemporary with modern accents, cool marble floors and an appealing minimalism that runs contrary to the normally frenetic local clutter. Set high up a hillside, commanding views are available from various belvederes and bedrooms. Chic and minimalist. Its 1,200sq ft Devi Garh Suite presents male and female Shiva-Shakti symbolism with the added lure of a Jacuzzi with a view and black marble pool, WiFi, a large flat-screen TV, and chocolate platter. Devi Garh can arrange bicycle tours and, for those with an eye on the sun and moon, literally, astrologers can be speedily summoned to make intricate readings. This is a classy Indian palace hotel hideaway. Mark it down for a honeymoon escape or more. From the Lebua group also spot the Lebua Resort Jaipur (dull faux-fort modern sandstone exterior paired with hip and colourful interiors) and the chic cubist Lebua Lodge at Amer, a luxury tent fantasy set in a garden area with modern marbled bathrooms. At the Jawai (formely Jawai Leopard Camp), open views and stylish modern tents are available for campers who need a bit of buzz and flair. Think high canvas ceilings, posh amenities, a spa, timbered patios with a pool, and Big Skies for high-def cameras of every shade. The camp is 140km from Udaipur and an hour's drive from Kumbalgarh Fort and the fabled marble-carved Ranakpur temples. 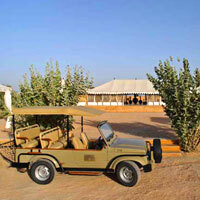 Operated by the same group, Sujan, is The Serai in Jaisalmer, another Rajasthan luxury tented camp. Just 260km from Udaipur, lies Jodhpur, the Blue City. As with most Rajasthani towns, one hue often predominates. The blue is best perused from atop brooding Jodhpur fort high above the hill. Situated in western Rajasthan, it is the second largest city in the state, and known for its beautiful “leheriya” sarees. Make sure you have a bite of the kachouris, and if that gets too spicy then pop some sweet ladoos into your mouth. No visit to Jodhpur is complete without a visit to the imposing Mehrangarh Fort, one of the most impressive in Rajasthan, with five kilometres of towering ramparts inscribing the top of a 125m crag. The fort towers over the city, smack in the centre of things. Inside the fort explore magnificent palaces decorated with intricate filigree panels and latticed windows. 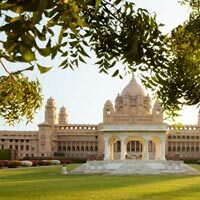 Topping the must-do list is a visit to the sprawling and stately Umaid Bhawan Palace (managed by Taj Hotels), which happens to be one of the most famous (and largest) personal residences in Rajasthan. The spacious 26-acre 347-room sandstone palace and grounds, named after Maharaja Umaid Singh, began running in 1943, with the hotel section boasting 64 luxurious rooms and suites. Guests can savour a whole new level of pampering accompanied by culinary delights in keeping with the royal nature of this palace. The palace was designed by the celebrated Edwardian architect Henry Lanchester, and its art deco nuances are complemented by the exotic murals of the self-exiled Polish artist Stefan Norblin. It’s an interesting blend of cultures, with the soaring 105ft-high cupola heavily influenced by the Renaissance style, while the towers are typical of the Rajput tradition. The art deco Maharani Suite is slathered in pink, black, chrome and mirrors with an inspiring Norblin mural of the Goddess Kali dominating. The bath has been carved out of a single slab of pink marble. A Rajasthan palace hotels icon, Umaid Bhawan has earned its spurs over the years and with good reason. You can also check into the plush Taj Hari Mahal. With Marwar-inspired architecture, Mughal domes and detailed enamel murals, the hotel is spread over six acres, and situated close to the city markets. A useful take-off point for village safaris to the desert heartland, this address offers guests an insight into local flavour. The Ummed Jodhpur (formerly Taj Gateway till May 2016), gives visitors yet another option in this beautiful desert town. A blend of old Rajasthan and modern amenities, The Ummed Jodhpur offers business travellers an additional springboard. If you fancy a stroll down history lane, travel 91km from Jodhpur to the fort palace of Khimsar. The atmospheric former WelcomeHeritage Khimsar Fort sits at the edge of the Thar Desert. Founded in the 16th century, the royal family of Khimsar has its roots in Jodhpur. A section of the fort is set apart as a private residence for the current “royals”. The ramparts of the fort offer views up close of majestic sand dunes. Those interested in vintage cars must visit the royal garage. Around an hour's drive off-road 60km from Jodhpur is the fairly modern faux fort confection of Mihir Garh (2009) with nine spacious 1,700sq ft rooms in local get-up, with luxe touches, a shared infinity pool and a few Rajasthani courtyards thrown in for good measure. Think, fountains, grand sunsets and sand. Suites serve up smooth arches, rich fabrics in crimson, green and turquoise, dark wood cabinets, and cool stone floors casually covered in carpets. This is an imaginatively designed escape with good finish and much thought, but it may be a bit twee for some. Yet, adults who enjoy a nice clean make-believe "heritage" playground, will revel in the touches and sense of being lost. Heading into the desert beyond Jodhpur, in Jaisalmer, marvel at some wondrously carved sandstone and marble noblemen’s homes, the fort, and a rustic way of life that continues unchanged. Hire a bicycle to get around and explore the shops. With the tourist influx, prices are going up but there is always good shopping to be had in Jaisalmer. The city was founded in AD1156 by the Bhatti ruler Rawal Jaisal. A short drive west from here brings you to the Sam Dunes where cameleers await to whisk you off into the desert for a safari, an overnight expedition, or a quick trip for the kids to get some sand in their shoes. While in Jaisalmer, look at Fort Rajwada. Though it was built to accommodate tourists, this hotel manages to exude something of a regal aura, all at less-than-wallet-breaking prices. Expect carvings, traditional balconies and a sense of Jaisalmer haveli architecture. Head up to the roof to catch the sunset. 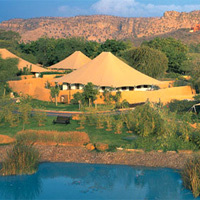 In Jaisalmer, operated by the Sujan group is The Serai, another Rajasthan luxury tented camp. Sister product to the Jawai camp. Shekhawati is an area that needs little introduction to salivating Indophiles. The colourful and imaginative frescoes and intricate hand painted walls that adorn the district and sleepy villages are enough to keep any shutterbug happy. This is where the country's fabulously wealthy Marwari community once thrived. An excellent base for exploring this region is The Piramal Haveli in Bagar run by the Delhi-based Neemrana Hotels group that has transformed many a derelict mansion into a heritage hotel of distinction. The haveli (or nobleman's house) offers echoing pillared corridors, peacocks on the lawns and, with sufficient notice, torch-lit dinners on the dunes. Piramal Haveli is an unfussy, laid-back Rajasthan heritage hotel choice for those seeking authenticity and history without aggressive "modern" intrusion. Here you will have an opportunity to savour a bygone era, slowly. Tea with the peacocks is a must on your to-do list. So, whether there’s sand in your shoes, or peacocks on your shoulder, this is the A to Z of the best Rajasthan palace hotels and heritage hideaways. Pick your camp and explore. Do be careful. Camels can bite and they are ill-mannered beasts at best of times. 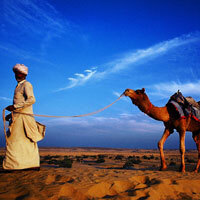 The best climate for visiting Rajasthan is from mid-October to mid-March when it’s not scorching. On average winter temperatures range from 8C to 28C (46F to 82F) and summer temperatures range from 25C to 46C (77F to 115F). The exchange rate is roughly US$1 = Rs66. Also see our printable map of Rajasthan detailing places of interest. Any room rates mentioned here are rule of thumb for general relative comparison only. Prices will vary depending on the season. Winter is the high season with the highest prices. Always check for the best available rates (BAR) online and talk with your travel agent. In general room prices may range from around Rs3,000-Rs4,000 at guest houses, Rs6,500 at small off-the-beaten-path nondescript palace hotels, Rs17,500 at mid-range palace hotels with solid heritage appeal, up to Rs50,000 (US$800) and more at an international chain luxury resort or high end Indian hotel chain. 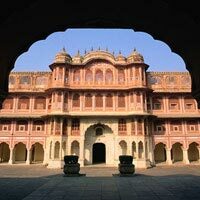 Informative websites include the very detailed India Tourism Incredible India site (www.incredibleindia.org) with a dedicated section on royal retreats and Rajasthan Tourism’s extensive site (www.rajasthantourism.gov.in). Neemrana Fort Palace. New Delhi Reservations Tel: [91-11] 4666-1666, (e-mail: sales@neemranahotels.com or fort-palace.neemranahotels.com). The Sariska Palace. Tel: [91-144] 284-1323, (e-mail: directsales@thesariskapalace.in or www.thesariskapalace.in). Chomu Palace Hotel. Tel: [91-1423] 300-300 fax: 300-400, (e-mail: info@chomupalacehotel.com or www.chomupalacehotel.com). Dera Mandawa. Tel: [91-141] 511-8490, (e-mail: info@deramandawa.com or www.deramandawa.com). Fairmont Jaipur. Tel: [91-142] 642-0000, fax: [91-142] 642-0011. (e-mail: jai.reservations@fairmont.com or www.fairmont.com/jaipur/). ITC Rajputana Jaipur, A Luxury Collection Hotel. Tel: [91-141] 510-0100, fax: 510-2102, (e-mail: reservations.itcrajputana@itchotels.in or www.itchotels.in). Le Meridien Jaipur. Tel: [91-1415] 114-455, fax: [91-1426] 515-151, (e-mail: reservations.jaipur@lemeridien.com or www.lemeridien.com/jaipur). Lebua Lodge at Amer. Tel: [91-141] 305-7211, (www.lebua.com/lebua-lodge-amer). Lebua Resort Jaipur. Tel [91-141] 305-0211, (www.lebua.com/lebua-resort-jaipur). Lohagarh Fort Resort Jaipur. Tel: [91-141] 410-7860, (e-mail: sales.lohagarhfortresort@gmail.com or lohagarhfortresort.in). Mandawa Haveli. Tel: [91-141] 371-194, fax: 237-2084, (mandawahaveli.com/). Raj Palace. Tel: [91-141] 263-4077 / 263-4078, fax: 263-0489 / 237-3119, (e-mail: gm@rajpalace.in or www.rajpalace.com/hotel-raj-palace.html). Rambagh Palace. Tel: [91-141] 221-1919, fax: 238-5098, (e-mail: rambagh.jaipur@tajhotels.com or https://taj.tajhotels.com/en-in/taj-rambagh-palace-jaipur/). Samode Palace/Samode Bagh/Samode Haveli. Tel: [91-141] 263-2407, fax: 263-1397, (e-mail: sales@samode.com or www.samode.com). The Gateway Hotel Ramgarh Lodge. Tel: [91-142] 621-4027, (www.thegatewayhotels.com/ramgarh-lodge). The Oberoi Rajvilas. Tel: [91-141] 268-0101, fax: 268-0202, (e-mail: reservations@oberoigroup.com or www.oberoihotels.com/oberoi_rajvilas/). Trident Jaipur. Tel: [91-141] 267-0101, fax: 267-0303, (www.tridenthotels.com/jaipur/). Ajmer Bungalow. Tel: [91-145] 262-8759, mobile:  98119-99080, (e-mail: naveencapoor@gmail.com or ajmerbungalow.com). Chhatra Sagar camp. Tel:  941-412-3118, (www.chhatrasagar.com/index.html). The Greenhouse Resort. Tel: [91-145] 230-0079, fax: 277-3704, (e-mail: reservation@thegreenhouseresort.com or www.thegreenhouseresort.com). Amanbagh. Singapore Tel:  6883-2555, Alwar tel: [91-1465] 223-333, fax: 223-335, (e-mail: amanbagh@amanresorts.com or www.amanresorts.com/amanbagh/). Aman-i-Khás. Singapore Tel:  6883-2555, Ranthambhore Tel: [91-7462] 252-052, fax: 252-178, (e-mail: aman-i-khas@amanresorts.com or www.amanresorts.com/amanikhas/). Ramathra Fort. Tel:  982-901-3475, (ramathrafort.com). The Oberoi Vanyavilas. Tel: [91-7462] 223-999, fax: 223-988, (e-mail: Ratna.Malhotra@oberoihotels.com or www.oberoihotels.com/oberoi_vanyavilas/). Vivanta by Taj – Sawai Madhopur Lodge. Tel: [91-7462] 220-541, fax: 220-718, (e-mail: Vivanta.sawaimadhopur@tajhotels.com or vivanta.tajhotels.com/en-in/sawai-madhopur-ranthambore/). Jawai. Tel: [91-11] 4617-2700, (e-mail: reservations@sujanluxury.com or sujanluxury.com/jawai/index.htm). RAAS Devi Garh. Tel: [91-2953] 289-211, fax: 289-357, (e-mail: salesindia@lebua.com or raasdevigarh.com/). Shikarbadi Hotel Udaipur. Tel: [91-294] 258-3201, fax: 258-4841, (e-mail: crs@hrhhotels.com or www.hrhhotels.com/royal_retreats/shikarbadi_hotel/). Taj Lake Palace. Tel: [91-294] 252-8800, fax: 2528700, (e-mail: lakepalace.udaipur@tajhotels.com or taj.tajhotels.com/en-in/taj-lake-palace-udaipur/). The Lalit Laxmi Vilas Palace. Tel: [91-294] 252-9711, fax: 252-6273, (e-mail: udaipur@thelalit.com or www.thelalit.com/the-lalit-laxmi-vilas-palace-udaipur/). The Leela Palace Udaipur. Tel: [91-294] 670-1234, fax: 670-1212, (e-mail: reservations@theleela.com or www.theleela.com). The Oberoi Udaivilas. Tel: [91-294] 243-3300, fax: 243-3200, (e-mail: Vincent.guironnet@oberoihotels.com or www.oberoihotels.com/oberoi_udaivilas/). Trident Udaipur. Tel: [91-294] 243-2200, fax: 243-2211, (www.tridenthotels.com/udaipur/). Fort Rajwada, Jaisalmer. Tel: [91-2492] 255-433, (e-mail: reservations@fortrajwada.com or www.fortrajwada.com). Khimsar Fort. Tel: [91-141] 222-9700-704, (e-mail: reservations@khimsar.com or www.khimsar.com/). Mihir Garh. Tel: [91-291] 243-1161, (e-mail: bookmihirgarh@gmail.com or mihirgarh.com/). Umaid Bhawan Palace. Tel: [91-291] 251-0101, fax: 251-0100, (e-mail: Umaidbhawan.jodhpur@tajhotels.com or taj.tajhotels.com/en-in/umaid-bhawan-palace-jodhpur/). The Ummed Jodhpur (formerly Taj Gateway). Tel: [91-291] 662-1111, fax: 226-3244 (e-mail: Sales@Ummedhotels.com or www.ummedhotels.com/jodhpur/). The Serai. Tel: [91-11] 4617-2711, (e-mail: reservations@sujanluxury.com or sujanluxury.com/the-serai/). The Piramal Haveli, Bagar, Shekhavati. New Delhi Reservations Tel: [91-11] 4666-1666, (e-mail: sales@neemranahotels.com or neemranahotels.com/piramal-haveli).